100 people have viewed this property this week. Calypso Blue has been fully renovated and redecorated, but is still at a reasonable cost for a larger family. Oceanfront freshwater pool with a sandy beach area lead to excellent coral reef snorkeling just steps from the back door. 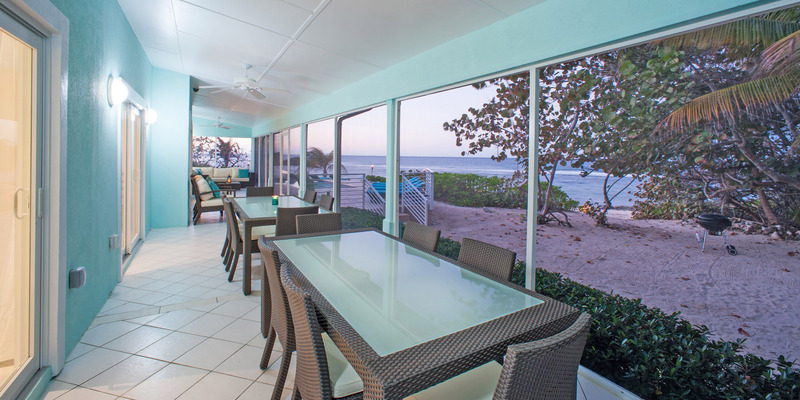 A large oceanfront screened porch is the perfect place to dine or relax after a day of sun and surf. New owner has replaced everything from windows and doors to all new furniture! The 3,400 sq. ft. open floorplan features a large brand-new kitchen with modern appliances, a large breakfast bar, and vaulted ceilings. The house has two living areas, both featuring large flat-screen TVs, comfortable seating and plenty of space for everyone to spread out and relax! The dining table is usually set up for 6, but the owner has 2 leaves to expand the table to seat 12. The screened porch offers two rectangular dining tables which will seat 12 guests total. Calypso Blue features two bedroom wings, allowing multiple families to stay in privacy. 2 king master suites and 2 queen bedrooms with shared large bath, plus stairs to the 2 twin bedrooms and shared bathroom upstairs. 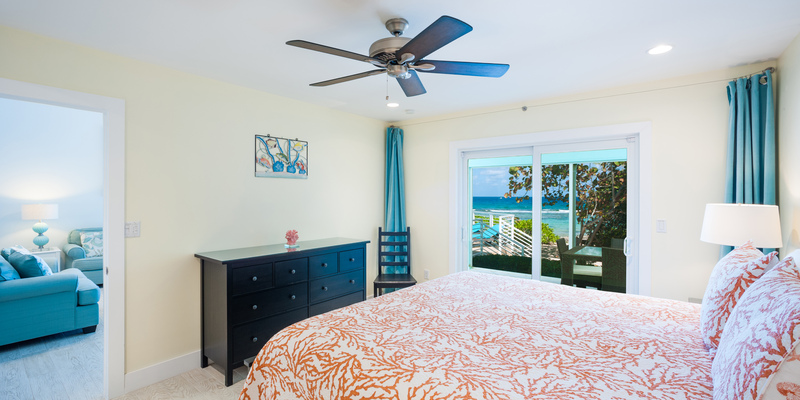 3 of the first floor bedrooms have oceanviews with access to the large screened porch. The 4th bedroom with queen bed has a private view to the east. 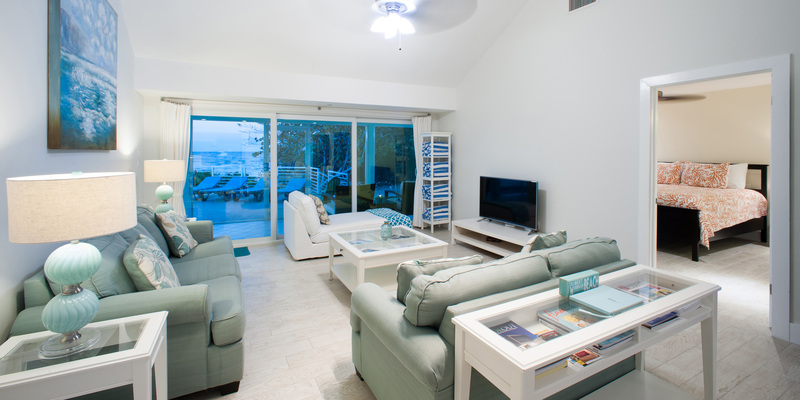 Modern furniture and furnishings were imported to outfit Calypso Blue in wonderful style. Indoor and Outdoor Dining for 12! For guests who want to relax on the beach, porch or deck, enjoy the ocean and pool, and generally kick back in their own private beach home, Calypso Blue is ideal. Walking distance to a small grocery and the house is also within a reasonable driving distance to watersports, restaurants, East End resorts and the famous Rum Point Club. The homes in Northside offer great reef protected snorkeling. The beaches can have plenty of white sand, but can also be pebbly or rocky ironshore with natural rock formations too. Either way, with the abundant marine life we have in the water, you will want to wear pool shoes or fins for foot protection. The prevailing trade winds from the east also make flying insects less of a nuisance—many of the homes on Northside don’t even need a screened porch. In northside we have a primary school, a health clinic with ambulance, a post office, and Chisholm’s grocery store for the basics. We also have Over the Edge restaurant closer to Old Man Bay—a casual restaurant with a deck over the water serving great food and reasonable prices. Northside is an easy 10 minute drive from Rum Point, as well as 10-15 minutes from the Lighthouse restaurant, Tukka restaurant, and the east end resorts—Morritts and The Reef. Both resorts offer bars, restaurants, pools, watersports, plus a nearby grocery store and local lunch spots. The house was just as described and photographed! The management was very responsive to our needs. The only problem we had was getting to the house from the airport! First time visitors need a map with turn by turn instructions! Other than that, we loved it. Beds were comfortable, bathrooms nice, kitchen fully equipped, house clean, nice washer/dryer, wi-fi worked, etc. It was windy during our stay so we were not able to swim or snorkel at our beach. But it was beautiful. A little sargassum but not a problem like other places I\'ve visited in the Caribbean. I would highly recommend this house! This was our 2nd visit to Calypso Blue and it was spectacular. From the moment we arrived, we felt so comfortable and at home. Calypso Blue is clean, well maintained and fully stocked with whatever you need. While at Calypso Blue, We enjoyed kayaking, building sand castles in the back yard, relaxing by the beautiful pool and making precious memories. We did check out some of the local restaurants such as Over The Edge, Taco Cantina, Rum Point, The Lighthouse and Kaibo. They were all delicious and exceeded our expectations. Thank you Calypso Blue for another wonderful week. We will be back soon! This house was amazing for our family of 11...6 adults and 5 kids. We were able to spend quality time together because of the layout of the house. The property had everything we needed for a relaxing week with family. We had a range of ages in our group and everyone thoroughly enjoyed themselves. The house was equipped with everything we needed. The view and location were perfect. Spectacular down to the details. Excellent owner and management. Absolutely amazing property. Support staff extremely engaged. Owner on top of helping in any way you need. Was very flexible with us as no one immediately before or after us. Great quiet location but easy to reach the busy tourist areas as well. Loved our Silver Thatch charter that we took to see the stingrays, snorkel, and play with starfish. Will be doing this again in the next few years. Beautiful house, unbelievable location. Outstanding! One of the more comfortable homes I've ever stayed in, in spite of a full week of torrential rains every day! A couple of days we had some break-through clouds. My son-in-law and his friend decided to get scuba certified as they had the time to study! Success!! Wonderful snorkeling experience off shore. Crystal Caves were something we wouldn't have normally done, but were happy to stumble upon it. It was a great combo of family and friends and memories were made! Planning on returning next year. Thank you so much! P.S. The gym was great too! Such a beautiful & cozy home! 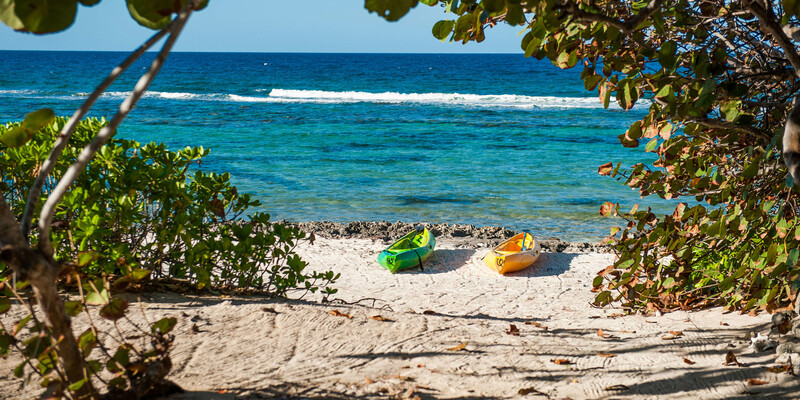 Our families enjoyed all the amenities Calypso Blue had to offer, especially the ocean kayaks. We really enjoyed staying on the North Side of the island away from the more touristy parts. It allowed us to have a truly relaxing week together. We definitely will be making return trips here in the future! Thank you!! Our family had a wonderful time in your lovely vacation home! The beach, snorkeling, kayaking, and pool were amazing. Thank you for allowing us to use Calypso Blue! We absolutely loved staying at Calypso Blue. What a beautiful home you have! We enjoyed this beautiful island from one end to the other and hope to be back soon. Thank you for your hospitality! We spent an amazing week at Calypso Blue celebrating 70th birthdays for the grandparents! This was a perfect family place – we enjoyed it all – the snorkeling, kayaks, pool, outside table, fishing, and happy hour on the patio. This home is gorgeous and cozy – we loved it! We enjoyed lunch and dinner at Rum Point, swimming with the -- at Mimi's Bar, Kai Bo, Sting Ray City and 7 mile beach. This is truly a little slice of heaven on earth – and taking home some memories of a lifetime. Thank you! We spent an unforgettable week in Calypso Blue! The beach was great – especially the "backyard" reef. We really enjoyed the pool and relaxing on the beach! Our families can't wait to return to Grand Cayman soon. PS We loved the wildlife – especially the blue lizards & chickens on the island! This was our second trip to Calypso Blue and it was amazing! Our son had a great time making sandcastles, jumping in the pool, looking for starfish at Starfish Point, and soaking up the sun. Calypso Blue is our family's "Happy Place" and we always enjoy our time here recovering from the craziness of life. The home is always clean, cozy, and has all the items we could need! Make sure to ask for Tido when you go to Tukka, and the electric margarita at Rum Point is AMAZING. This was a great house for a family vacation. We enjoyed the pool and the amazing snorkeling right off the beach at the house. The House was clean and comfortable for our two families. We hope to come back again soon! Beautiful home easily fit our group of 9. Everything was clean and up to date. Snokeling out the back door! Can't wait to go back. The views and the snorkeling is incredible! The house is very nice and spacious. We comfortably fit 11 in the house. It was recently renovated and is a pretty house. The pool area and deck was also awesome! We also used the kayaks almost everyday. Would definitely recommend this place to any future tourist! Our large group had an amazing stay at Calypso Blue! The updated decor is beautiful and the house is spacious with the two living areas. The home was very clean and welcoming. We enjoyed the pool, lounging on the beach, using the kayaks and the view was amazing! We would definitely rent this home again! Three families spent the week at Calypso Blue. The home was perfect for us. We spent most of our time on the lanai and in the pool. We also went kayaking and snorkeling in the ocean. We took a tour of Stingray City, we went hiking in the caves, and we also went on a dinner cruise. So many great places to eat close by. We also enjoyed watching the baby chickens and finding little lizards. We found so many starfish at starfish point. We all agreed this was the best vacation ever!! There was beautiful weather everyday, just what we wanted. Snorkeling by the bay and kayaking, swimming, in the pool were fun and relaxing. Must see places are a drive on the Eastern shore to see the blowholes and Tukka's. Rum Point is a fun place for drinks, food, and snorkeling. Starfish point is a must see. Jet Ski tour with Sweet Spot at Kaibo- ask for "Slim", he gave an awesome tour to StringRay City. Pure Art Gallery on the way to Georgetown has a unique selection of gifts, most made by local craftsman. We will definitely be back! Thank you for opening your home to us, it was so comfortable and beautiful. BEST. VACATION. EVER. Beautiful house, beach, pool, best snorkeling was right here! Favorite place was Smith Beach. Awesome time swimming with stingrays! Thankful to have been able to come here. Many memories to hold onto! We couldn't have experienced anything better... Calypso Blue was the greatest vacation home... 12 in our group and the place was more than enough room. Beaches were awesome especially Smith Cove... stingrays, starfish and snorkeling on the Catamaran was awesome. Tukka Restaurant for 5pm bird feeding was amazing. A dream come true in paradise!!! Our Week stay was incredible! The house is amazing. Best snorkeling right outside the house. My 2 favorite places for food were Kurts Korner and Czech Inn. Smith Cove Beach was a beautiful place for a swim. What an amazing visit we had. Hoping to plan a trip back next year. The greatest vacation I have ever had! Gorgeous house, quiet atmosphere, the best snorkeling on the island. Came with my son and daughter in law, daughter and son in law, and 3 of their friends. The best time ever! Loved your home and the tranquil atmosphere. Thanks so much; hope to return soon! Wow! I am struggling to find the words to explain how truly amazing our stay was this beautiful week at Calypso Blue! Your home is stunning, inviting, comfortable and probably the best view our crew has ever seen! We come from just north & south of Boston, MA and while it was snowing & sleeting at home, we were soaking up endless sunshine, warm breezes, and lots of cocktails! We were here together, three families and each of us had the time of our lives! Kaibo- we love Kevin the cat! Star fish beach - gorgeous! Rum Point- we loved lunch and lounging in the sun. We enjoyed cooking at home poolside, Over the Edge, Tukka, the Kaibo Grill and we loved out day with George and Mike at String Ray City. The locals were super friendly, we visited Chisholms a lot and most of all had the time of our lives chillin at the house with our friends. We celebrated a 9th birthday on our last night and it was so much fun! Amazing location on the peaceful and relaxing north side. House is fully equipped for a great vacation by the sea. Cozy, clean and stylish decor throughout the entire home. Snorkeling in back of the house is breathtaking. We saw many different fish including buffers and stingrays. We enjoy trips to Rum Point and we loved exploring the crystal caves up the road. Can't wait to go back to Calypso Blue! This was the third time our family has stayed at Calypso Blue. We enjoy the the peaceful and relaxing Northside of the island. The home is clean, cozy and has beautiful decor throughout. The kitchen is fully stocked for cooking meals and the grills out back make for other cooking options. We love being able to go snorkeling right off the beach in the back. Rum Point is fun to hangout at too! We can’t to go back again!!! Calypso Blue is our home away from home! This house was all it promised! We loved the set-up and snorkeling from the backyard. The owner was very connected, checking in by email daily to ensure we were pleased. I would definitely recommend this if you are looking to get away from the tourist traps, and want your own private oasis away from town and traffic. My teenagers loved having their own wing of the house, and we enjoyed the screened in porch to enjoy a break from the sun. Thank you for a fantastic vacation! Just got back from a fabulous vacation on Grand Cayman. Calypso Blue is a beautiful house. We had a group of twelve adults that stayed there for a week. The house had plenty of space and didn’t feel crowded. Some of the best snorkeling right outside the house. It’s just a quick walk to a little grocery store, which was really convenient. Loved staying on the North Side which is a little quieter. Calypso Blue exceeded all of our expectations! There were three families, nine of us together in the home. The furnishings were beautiful. The home very spacious. The kitchen was stocked with everything you would ever need. There was also lots of beach towels! We appreciated the heavy duty washer and dryer. We loved the screened porch and spent many hours there. The view of the ocean from the pool was spectacular! Everyone loved having access to kayaks! The location was awesome! We enjoyed Starfish Bay and other attractions that were close. Local restaurants we really enjoyed were Tukka and Eagle Rays. We took an evening cruise and had dinner at Morgan’s. We vacation together as families every year. 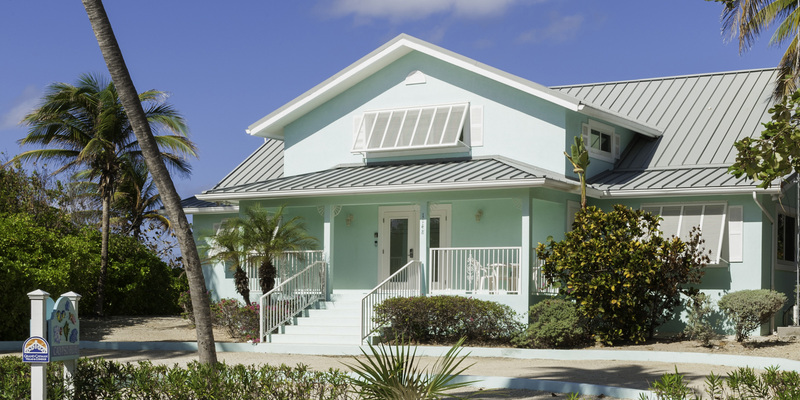 We all agreed Calypso Blue was one of our favorite vacation homes! The resident chickens and rooster were fun to watch! We had an amazing week at Calypso Blue. The house was great, all the comforts of home and many more! We snorkeled everyday right out front of the house and it was incredible. Loved being on the quieter side of the island and exploring the beaches near us. All 12 adults all enjoyed the trip! We just got back from a week long stay! There were 12 adults. We were all blown away with how beautiful and spacious this villa was. Everything was super clean and beautifully decorated. My biggest issue when traveling is usually how uncomfortable the beds are, but the beds here WERE SO COMFY! I think I had the best sleep I’ve had in a long time 🙂 We really enjoyed going to rum point, Kaibo and Tukka.. but was great to cook/grill at home. We also loved snorkeling and kayaking right in our own backyard! We hope to return to this property sometime in the future! The owners were also great about reaching out during our stay as well as after our stay to be sure our stay was the best experience possible! You will not be disappointed! We just got back from a week long stay! There were 12 adults. We were all blown away with how beautiful and spacious this villa was. Everything was super clean and beautifully decorated. My biggest issue when traveling is usually how uncomfortable the beds are, but the beds here WERE SO COMFY! I think I had the best sleep I’ve had in a long time 🙂 We really enjoyed going to rum point, Kiabo and Tukka.. but was great to cook/grill at home. We also loved snorkeling and kayaking right in our own backyard! We hope to return to this property sometime in the future! The owners were also great about reaching out during our stay as well as after our stay to be sure our stay was the best experience possible! You will not be disappointed! We stayed at Calypso Blue for a week in April 2018. 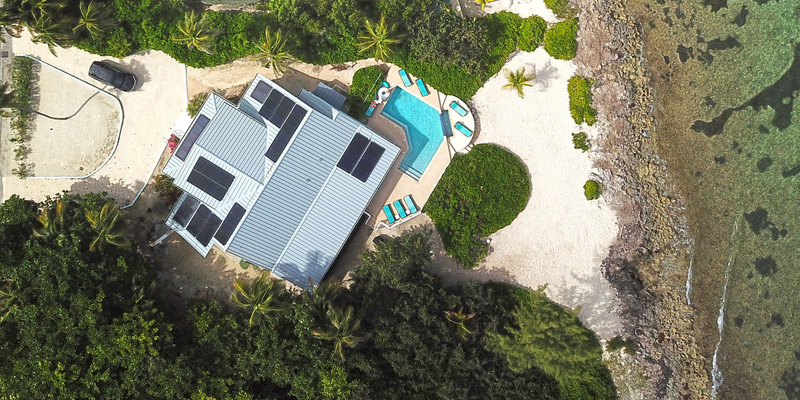 The house was absolutely amazing with its gorgeous views, a beach that you could snorkel and kayak from, newly renovated and decorated throughout and a pool! What more could you ask for! The owner and property manager were great to work with, staying in touch and checking in on us. The house was immaculate and had every amenity you could think of to enjoy your stay. We had 6 adults and 6 children (ranging from 9-14 years old) and the house was plenty big enough to accommodate all of us comfortably. The house is not far from Rum Point, Starfish Point and great restaurants such as Kaibo , Over the Edge, Eagle Rays and Tukka. We enjoyed staying on the North Side of the island. We had an amazing trip and did not want to leave. We hope to be back at Calypso Blue again one day!! Thank you for sharing your home with us! Beautiful Home that every touch! We stayed in the home for a week during April 2018. The weather and house were amazing. The property was completely renovated from the floors, to beds, kitchen, to the doorknobs. The owner of the property was always in touch making sure that our stay was amazing. The house was immaculate where not a single grain of sand was on the floor when we arrived. The pool was great to relax in plus the view from the pool deck was just as nice. The owners were amazing to work with and always available to answer any questions or to fix anything as needed. The location was perfect by being quiet yet close enough to Rum Point to get there in 15 minutes. We would totlally stay there again and hope to someday in the near future. Great snorkeling and kayaking from the beach. The pool and patio were perfect and we spent most evenings (after watching each sunset) playing games on the screened in porch which had fabulous ocean views and breezes. Tons of room and all the space was useable. We had a fabulous time. Everything in the house was very new. Beautiful home, beautiful views, beautiful pool! We loved our stay here. The house is decorated in a beautiful island them, pretty beachy colors in all of the rooms. The screened in porch is heaven. We used the kayaks, snorkeled right off of our beach, swam in the pool a ton. The home is very well maintained and managed. I met a neighbor that told me her family has stayed at Calypso Blue twice. I would definitely stay there again. I miss it already!! We had the most amazing time with a group of friends at Calypso Blue!! It is even more beautiful than the photos depict!! It is so clean and well kept. We were able to totally relax and enjoy all that the peaceful North side of Cayman had to offer. We will definitely be returning to Calypso Blue on our next trip to Cayman. Craig, the owner, was so helpful with suggestions before we arrived and making sure that everything was as we expected. Everything was so comfortable and relaxing. There was plenty of room for all of us. We really enjoyed snorkeling just outside the back door! We had a great time renting jet skis from "Sweet Spot" at Kaibo. Slim was a great tour guide for sting ray city. We can not wait to return to Calypso Blue!! We came to celebrate many different things from 30th & 60th birthdays to a 35th anniversary. Sever of us got to go diving which was beautiful! Snorkeling right in the back of Calypso Blue was amazing. My husband and I said we could of dane that all day long and never get bored, so much to see. The children and their Grandma enjoyed the pool and the sand close by: I think all in all this was a trip that will be remembered forever. We had a wonderful time! Calypso Blue has a great view and we had big winds and surf during our trip. All in all it was an awesome time! Best the Caymans Have to Offer! Traveling with 5 children 5 and under can, and was, stressful, but one day here on the Northside made it all a distant memory. 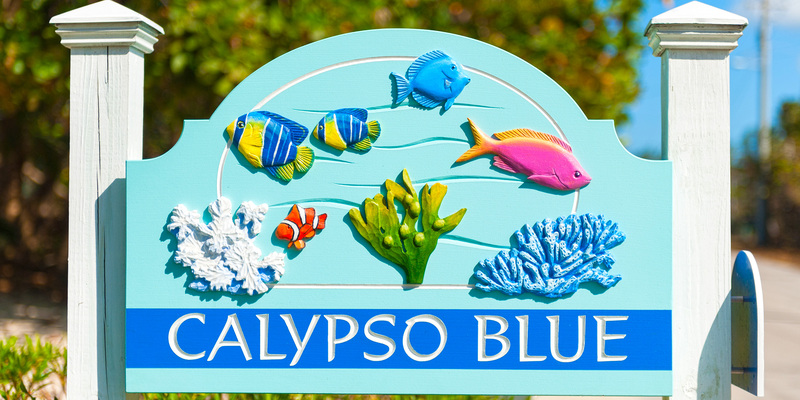 Calypso Blue was the perfect place to enjoy the best the Cayman Islands has to offer. Beautiful weather, the sounds of the sea, accommodations via pool, sand, snorkeling, kayaks, and the list goes on. Up to 9 visits we've had and we still can't find a better place to be in February. While we had to spend more time at home than usual we still enjoyed Tukka, Over the Edge, Rum Point, Frank Sound, and the Barefoot Beach. Thanks for providing us with a beautiful home to give us a play to lay our weary heads each night and a decent kitchen to feed our tummies when needed. Villa was amazing. Updated throughout! Everyone had a great time. The home was immaculate. We also enjoyed the roosters running free, the beautiful iguanas, and driving on the opposite side of the road. Calypso Blue was the perfect house for our Cayman Christmas. We were a group of 10 - adults, teenagers and grandparents. There was plenty of room of all of us to each have our own space and the open layout of the main area made it easy to socialize. The entire house is nicely decorated and furnished making it very welcoming and comfortable. We especially loved the screened in porch area. We played board games, had dinner, read books and even had our Christmas morning out there. It's just such a great spot to look out over the ocean and feel the breeze - beautiful! The kitchen had everything we needed to prepare a full Christmas dinner of tenderloin and grilled lobster along with all the fixings. Lots to do right at the house. We snorkelled right outside our place and used the kayaks - it's very shallow and easy to swim in, you just need water shoes to get past the ironshore which is beautiful in its own right. The teenage girls in our group over to lounge by the pool - lots of comfy loungers provided! The owner checked in with us more than once to ensure everything was going well and the property manger both visited us and called to check up. Once a handle broke on the screen door and it was taken care of immediately. We had a lovely time at Calypso Blue and would recommend it for a stay in Cayman! Calypso was perfectly described from the website along with being clean on our arrival with 6 adults and 2 young children. It was on the North side away from all the traffic of 7 mile beach. It was a tranquil setting but only a mile from Rum Pointe where we spent a lot of our time. 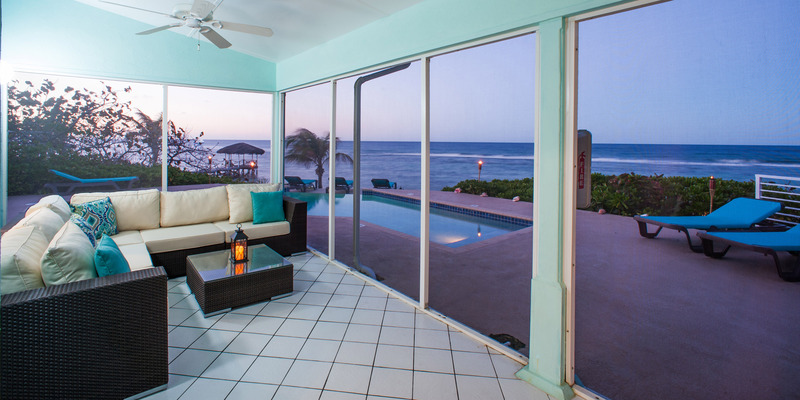 I would certainly recommend this vacation house to anyone considering the Caymans. We loved every glorious second that we spent in your lovely home. It had everything we needed and more- so much so that we never wanted to leave. The views were spectacular. Make sure to visit Rum Point and try their famous Cayman Lemonade. Hurley's is a great grocery store and it has a better selection than its competition Foster's. Finally, and most importantly, we left a giant inflatable flamingo for you to use. Love him as if he were your own. He's a gentle pink soul and we hope he bring you as much joy as he brought to us. After what was a stressful week worry about Hurricane Irma and its potential effect on family and friends, we were very happy to make it to Calypso Blue! The house is so welcoming. We loved snorkeling, the wonderful pool, and sitting under the trees. We are finding it very difficult to leave this paradise. We visited the blow holes, starfish point, stingray point and loved diving with Red Sail Sports. We ate at Over the Edge, had lunch at Rum Point and dinner at Tukka last night was most excellent. We ventured to 7 Mile Beach one day and ate out by the water at the Cracked Conch, across from the Turtle Sanctuary. All in all an amazing week. Thanks for sharing your home. We had an amazing stay! This was our first time to Grand Cayman, and the choice of renting this was perfect. We drove the entire island and could not have picked a better spot. We took two charter trips with George through Silver Thatch charters, and Sting Ray City is an absolute must! We also rented two paddle boards, along with the house kayaks for some fun family bonding. Thank you for your gracious hospitality and sharing this beautiful island with us- a trip we won\'t forget! We had an amazing vacation here celebrating a birthday milestone and family vacation. Calypso Blue is just beautiful, very well organized and decorated wonderfully. 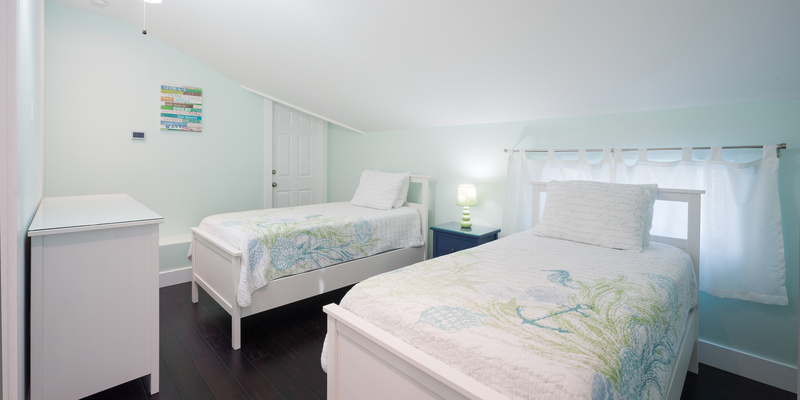 Every room at Calypso Blue was comfortable, clean, and warmly decorated. It exceeded our expectations upon arrival and all throughout the trip. Thank you to Craig, the owner, for being so responsive and efficient throughout the trip and for all your recommendations. We loved the pool, the beach, and the kayaks. The house was stocked with so many items: towels, kitchen supplies, great washer/dryer. This house easily accommodated our 9 adults and 2 kids. Our favorite places to visit were String Ray City, Spotts Beach for snorkeling & turtles, Rum Point and the Kaibo. We also highly recommend Kaibo Grill and Bombay Chopstix. Thank you for the memories! We all had a wonderful time staying at Calypso Blue! The house was perfect and the owners were constantly checking in on us to see if there were any problems they could fix. The beaches were lots of fun and the sea was beautiful. There was not a restaurant we went to that didn't have delicious food. We got a charter, swam with the sting rays, and was unique marine life while we were snorkeling. The summarize it all, the trip was awesome! We had the best time at Calypso Blue! Everything was just perfect! 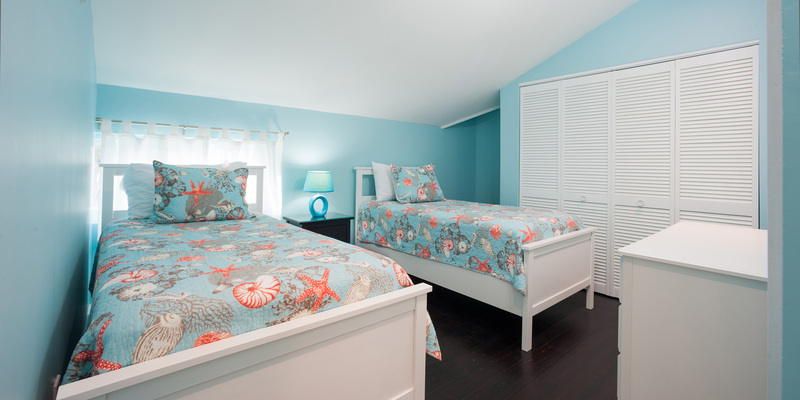 Calypso Blue is the perfect house for a relaxing getaway! Perfect time at Calypso Blue and Grand Cayman! This was our first trip to Grand Cayman to celebrate "milestone" birthdays! We had a blast! We stayed close to Calypso Blue most of the time... dining at Tukka (tacos, they lived up to the hype), Rum Point Wreck Bar and Kaibo Beach for pizzas, and for our last night an amazing dinner at Kaibo Upstairs!!! We also made it to the other side of the island to see Turtle Centre and have lunch at Sunshine Grill. Visited Starfish Point (go early), the blow holes and Rum Point Beach. The Color Garden at the Botanical Park was excellent, and in home massages and spa treatments from Perfectly Pampered Cayman were amazing!!!! Mostly we just loved being at Calypso Blue, enjoying the pool and amazing view. Very comfortable house. Everything we expected and more. Highly recommend staying here - you will have a wonderful time!!! We had an amazing time at Calypso Blue. The house is beautiful and very clean.We were here with our children, their spouses and our grandchildren to celebrate my husband's retirement! We wne to Stingray sandbar(Silver Thatch Charters), a must do! We snorkeled and swam with dolphins at Discovery Cove, and visited the turtle farm. Several of us went scuba diving with White Sand. We dined at Duke's, Over the Edge, Tukka, Kaibo, Rum Point, EagleRays. All were very good. We do not recommend The White House - very expensive and not that good really. The time we spent in the pool and the ocean was our favorite part. Felt like home! This was the BEST vacation ever! Loved the house. Calypso Blue was even better than we imagined. So open and spacious, and so clean and comfortable. It was perfect for the six adults and four kids. It had everything we needed. Lots of towels, pots, pans and dishes. We enjoyed the uniquely shaped pool. It was very refreshing. How nice to be able to snorkel and kayak just steps from the backyard. The sunsets and views were awesome. At night you should check out the stars--glorious. We were glad we stayed on the North Side of the Island--more quiet, less touristy. We took advantage of the jet skis and paddle boards from Kaibo Beach, the Bioluminescent Boat Tour from Rum Point, and the boat to Sting Ray City with Captain George from Silver Thatch. We had a wonderful nine days in this villa. We are very glad we found Calypso Blue. This was our family's first visit to the Cayman Islands and we chose this property to avoid the hustle and bustle of the touristy 7 Mile Beach area. We arrived to find ourselves beyond impressed with the layout of the house, the private pool, and the beauty of the ocean in the backyard. The home is well appointed, has ample space for a comfortable stay, and you can literally swim to the coral reef just 100 yards from shore. With close proximity to Rum Point for seeing starfish, sea turtles, and sting rays, it made for a perfect escape from our metropolitan routine. We'd highly recommend this home for active families looking for a blend of water sports and beachfront solitude. Beautiful home, perfect for large groups. Peaceful side of the island but with tons to do! Catch gorgeous sunsets, and sunrises from the porch, pool deck, or private beach. Beautiful decor inside and out. Best vacation home we have stayed in yet!! Loved the house!!! Very spacious for a group of 11 adults and 1 child. Property Managers came by in middle of stay to check on everything and was able to address our issues which were not many. The only drawback which is not owners or property managers fault is the trash pickup. After a week of family of twelve trash the cans were overflowing. I can\'t began to tell how much we enjoyed staying at Calypso Blue and would stay here again. Amazing Time at Calypso Blue! We rented a car from McCurley\'s tours which saved us the hassle of picking it up at the airport. They greeted us as we exited the airport and, after making a stop at the large grocery store and liquor store, transported us to Calypso Blue where the car was waiting. They also picked us up the day of departure therefore we only needed big enough car for bodies, not bags. This was a great suggestion from the owner and management that I would also recommend. Our trip was to celebrate a few milestone, 50th, birthdays and celebrate we did! 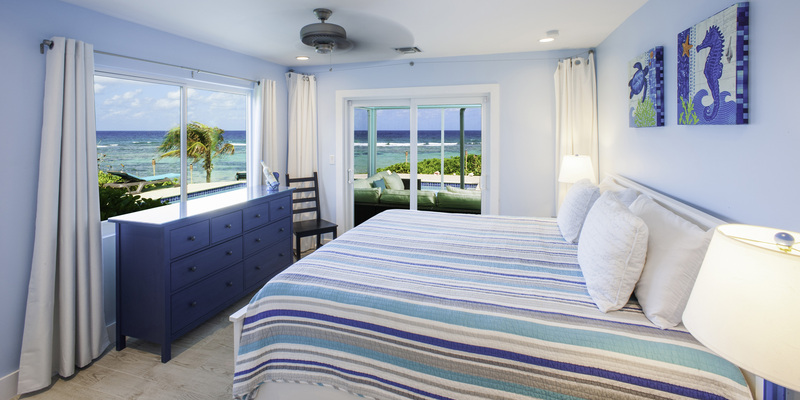 If you are looking for an one of a kind Cayman vacation, Calypso Blue is perfect. We will be back! We stayed at Calypso Blue with our children, their spouses our grandchildren and my sister in law here on Grand Cayman. The layout of the home is very comfortable with nice furnishings and a well stocked kitchen (with sharp knives) and lots and lots of beach towels (which was very helpful). We have rented many vacation homes on the North Carolina beaches and appreciated the owner contacting us before hand by email with details concerning the house and the area to help assure that our stay was all we hoped it would be. My friends and I came to Calypso Blue to celebrate my 50th birthday! The house, the island and the water could not have been more beautiful or mor welcoming! So far 50 rocks! This trip was our second time to Grand Cayman Island. We had an unbelievable time - the house was perfect. Thanks to the prior guests who left suggestions in the guest book. Our favorite restaurant was Tukka - wonderful food, ambiance and drinks!We also visited the Crystal caves and Blow Holes - both recommended. The snorkeling off the beach at the home was amazing. Of course the children enjoyed the pool! Lastly, having a table large enough to sit all of us, children, parents, grand parents was great! Highly recommend Calypso Blue - the kids are still talking about the trip - special memories for all! We had an amazing time at Calypso Blue. A long wait at immigration was soon forgotten once we set foot in the villa! Stunning decor and views... Tranquil and relaxing. We appreciated being on the less busy side of the island. We visited Stingray City by private charter and had the best time - you need to do this!!! Crystal caves were a treat and Tukka for Lion fish tacos were so good, we went twice. Thank you for helping us enjoy our special trip. We had an amazing trip and stay at Calypso Blue. The house was perfect for us - 6 adults and 4 big children. Favorite restaurant was Kaibo Upstairs great food and a wonderful setting! The bioluminescence tour was worth the trip. We will return one day! This was our second trip to Grand Cayman. The first time we stayed at another private home. Calypso Blue was amazing. Really nice having the privacy of your own home. Wonderful memories created with our family of 9 and our first grandchild "in the oven" on this trip! We cooked in for most of our trip as the home is very wel equipped with everything we could need, but we did dine out at Tukka, Over the Edge and The Lighthouse. Our evening dinner right on the beach at Tukka was amazing, but our dinner at The Lighthouse was outstanding - request outdoor seating at both!!! We spent a day on the beach at Rum Point, did some shorkeling, ate lunch and had some wonderful rum runners. We visited 7 mile beach which we found to be very touristy but still beautiful. We visited "Hell", the Botanical Gardens and an afternoon of shopping in George Town. There was only one cruise ship in port, so not too busy. But the very best times were spent here at Calypso Blue in the pool, on the beach, kayaking, snorkeling, grilling out and playing cards. Wonderful memories, we hope to be back soon. Thank you for sharing your beautiful home. Beautiful home, beautiful view, beautiful island! This would be our second visit to the island but our first stay at Calypso Blue. Calypso Blue is located on the "local" side of the island. I can't express enough how friendly and welcoming the local residents have treated us during both stays. Calypso Blue was perfect for our family of 9. Anything that we needed to make our stay comfortable was provided. Minutes from Rum Point, Starfish Point, Botanical Gardens. The mini grocery store was literally a couple houses down the road where we visited often for items that we did not purchase at Fosters in Georgetown. We cooked and grilled our meals and ate in the screened in porch that faces the ocean. We also ate The Lighthouse and Tukka. Thank you for sharing your home with us. We have created beautiful memories on a beautiful island! Calypso Blue is a beautiful property, very clean and well set up for a large group. We were four adults and six teens and preteens and we never felt crowded. Plenty of bathrooms for everyone. There's a little market very close by for all the basics. Rum Point is excellent for swimming and the snorkeling right off Calypso Blue is great, but don't forget to bring reef shoes! We had a great week with our best friends at the house. When you walk in you are greeted by a clean beautifully decorated home! They have thought of everything! As you go out the back door you realize you have just rented paradise! The pool, the view! We arrived at dark and if you have missed the stars you are in for a spectacular show! They are so close you can almost pluck them from the sky! And shooting stars are plentiful! I recommend a car or two for big groups. You can walk the beach to the left leaving the house and go to Chisholms for staples you have a need for (open 7-7 all days except Sunday 9 to 12 and 3 to 6. )Super nice people and really quite stocked. Bring a bag and walk past it and find lots of sea glass if the tied is down! Get up early and take kayak out for a sun rise or walk beach to the right again bring a bag, yup more sea glass and you can go pay your respects to the cemetery! I highly recommend Starfish Point, Rum Point, eat at Kurts Korner(delicious and you can afford it) ha, we rented a sailboat for the day from Sail Cayman Captain Neal: Capt Les was fantastic and it was a GREAT time!! !, go see the cement sculptures on Northside free, Smiths Cove, Cemetery beach, of course Hell as a quick stop when up that way, and shopping in Georgetown(go when just a few ships in port) makes it easier! Ha they close the stores at 5. But restaurants stay open! Botanical gardens is a great way to see what grows in the area and flowers were cool, the orchids have been eaten by the birds but all other specimens were quite beautiful! Bring a map everywhere you go, always! Pick up free magazines at airport and grocery store lots of discounts and free stuff to do! Bring sunscreen! Sand fleas during morning and at dusk on all beaches some of us were not affected by it some of us were. From the house to the top of 7 mile beach takes 45 minutes to 1 -1/2 depending on traffic. Most of all have fun and relax and stay to the Left. 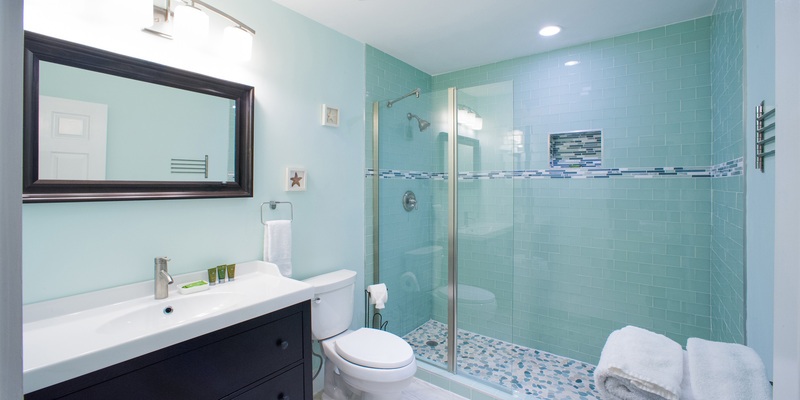 "Freshly renovated" and exceptionally renovated describes Calypso Blue. The unit met all our needs and then some. Superbly equipped kitchen, great dining areas (both inside as well as in the screened-in porch outside. The pool was great for all, especially for our 3 year old grandchild. Literally walked past the pool, onto the beach and right into the ocean for snorkeling. Depending on traffic, the unit is anywhere from 40-60 minutes from the airport. Calypso Blue is on what locals call the "north shore" and this is certainly the less populated and less touristy side of the island. There is always a breeze coming off the ocean, and that is welcome; walk out the front door of the house, not much breeze and it warms up quickly. A nice feature is the blue/white striped towels for use on site, and they also have a good supply of other beach towels which presumably are for use either on site or at other beaches you may choose to go to. We would rent Calypso Blue again and fell100% confident in recommending it to anyone. When you walk in you are greeted buy a clean beautifully decorated home! They have thought of everything! As you go out the back door you realize you have just rented paradise! The pool, the view! We arrived at dark and if you have missed the stars you are in for a spectacular show! They are so close you can almost pluck them from the sky! And shooting stars are plentiful! I recommend a car or two for big groups. You can walk the beach to the left leaving the house and go to Chisholms for staples you have a need for (open 7-7 all days except Sunday 9 to 12 and 3 to 6.) nice people and really quite stocked. Bring a bag and walk past it and find lots of sea glass if the tide is down! Get up early and take kayak out for a sun rise or walk beach! I highly recommend Starfish Point, Rum Point, eat at Kurts Korner(delicious and you can afford it) ha, we rented a sailboat for the day from Sail Cayman Captain Neal: Capt Les was fantastic and it was a GREAT time!! !, go see the cement sculptures on Northside free, Smiths Cove, Cemetary beach, of course Hell as a quick stop when up that way, and shopping in Georgetown(go when just a few ships in port). They close the stores at 5. But restaurants stay open! Botanical gardens is a great way to see what grows in the area and flowers were cool, the orchids have been eaten by the birds but all other specimens were quite beautiful! Bring a map every where you go, always! Pick up free magazines at airport and grocery store lots of discounts and free stuff to do! Bring sunscreen! Sand fleas during morning and at dusk on all beaches some of us were not effected by it some of us were. From the house to the top of 7 mile beach takes 45 minutes to 1 -1/2 depending on traffic. Most of all have fun and relax and stay on the left when driving! This was the most amazing vacation! 6 sisters and brothers-in-law. So many laughs! The home was beautiful and accommodating! Highly recommended for any families looking to rent Calypso Blue! What a wonderful home for 7 days! Everything was better than we anticipated, and we were expecting alot. Calypso Blue is so nicely furnished - both inside and out. The well stocked kitchen was appreciated and used frequently. When we come back to Cayman, it will be Calypso Blue! Our family had an amazing time at Calypso Blue. This house had everything we needed! It was clean and comfortable with spectacular views. The attention to detail did not go unnoticed! Our kids loved playing in the pool, building sand castles on the beach and snorkeling with the fish. We leave the home with beautiful memories that will last a lifetime. Thank you to the owner for sharing this amazing home! We cant wait to come back! What an amazing home! Spotless, private, beautiful and room for everyone to spread out!! Snorkeling in front of the home was fantastic! The pool was an added bonus!! Beach privacy with ability to go for long walks if desired! Perfect for a group vacation or several families!! Would recommend to anyone I know heading to Grand Cayman! Thank you so much for sharing this amazing home with us! Calypso Blue had everything we needed. Clean, comfortable and the perfect location. We loved being close to Rum Point and away from the crowded part of the island. We enjoyed the pool, kayaks, beach, snorkeling and lounging on the back porch. Thank you for helping create wonderful memories for our family. It was a first in a lifetime experience, and we cant wait to come back! From a very cold Utah, we are grateful! An Amazing House and an amazing View! Our vacation at Calypso Blue was absolutely fabulous! We swam oin the pool, snorkeled in the ocean and walks=ed the beach every day! We also took a bike tour of the island filled with historical information. Best experience of all we chartered a private boat to stingray sandbar and for some fantastic snorkeling (best we have ever seen anywhere) and lounging at starfish point. We also snorkeled at Spots Beach where we saw several sea turtles. You will not regret kayaking at night in bioluminescent bay!!!! This vacation was a family favorite and coming from cold Wisconsin, a wonderful respite!!!! My twin sister and I plus our families could not have picked a better place to stay for our first visit to Grand Cayman - and this will not be the last!!! Calypso Blue was perfect for our group of 10! The snorkeling, pool, kayaking and beach walks were amazing every time. We cooked many meals in the fabulous kitchen and there was room for everyone to spread out and relaxin their own space! Full attention to every detail, clean and a delight to rent. The island is beautiful - sea turtles, snorkeling, Rum Point, swimming with dolphins, stingray city sandbar, crystal caves... all of them made for a trip we will cherish and remember forever! You will not regret renting Calypso Blue! My family had a great stay at Calypso Blue! My family had a great stay at Calypso Blue! House was modern and very clean upon arrival. Appliances worked great and we did not lack anything to prepare meals. Location is awesome, especially for a family that likes a slower, tranquil pace. The property manager stopped by early on during our stay to introduce himself and make sure everything was O.K. We do not vacation at the same destination twice as we like to explore areas we have not visited. 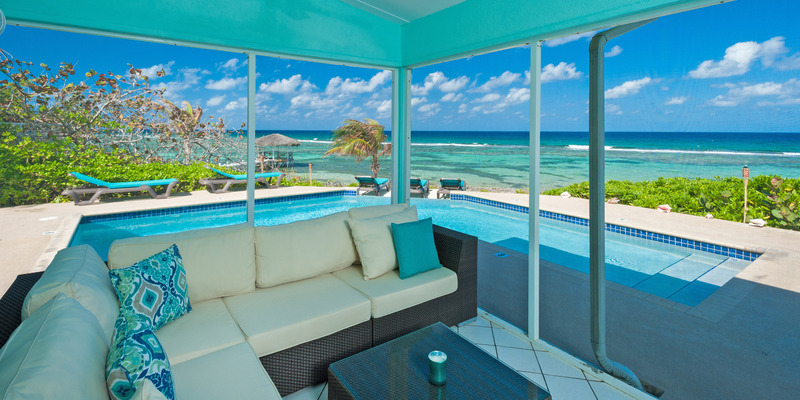 However, if and when we come back to Grand Cayman we will be staying at Calypso Blue. 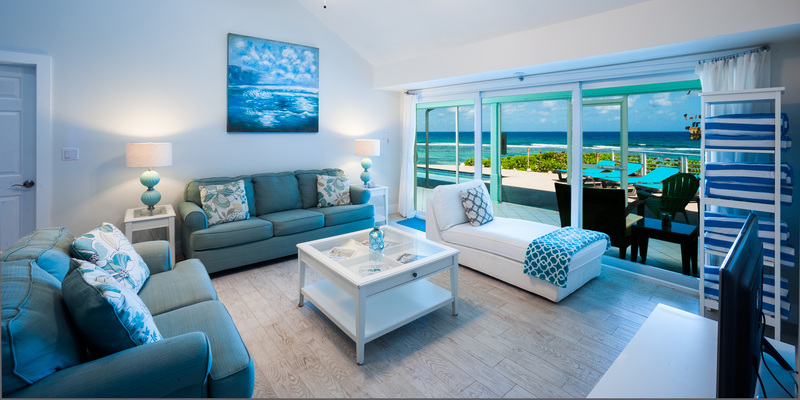 You have done a great job with Calypso Blue and I will be letting friends and family know that Grand Cayman was one of our favorite vacations to date and if they decide to go in the future that they should stay at Calypso Blue. Thank you for your kind words. We would love to have you back!!!! Most amazing vacation ever!!!! This house is perfect. We had 2 families with 4 kids total. I don't even know where to start. The location is great. It's close enough to restaurants and shopping, but no touristy crowds. Easy to get around. Minutes to Rum Point. The house itself is absolutely beautiful. It is immaculate even. 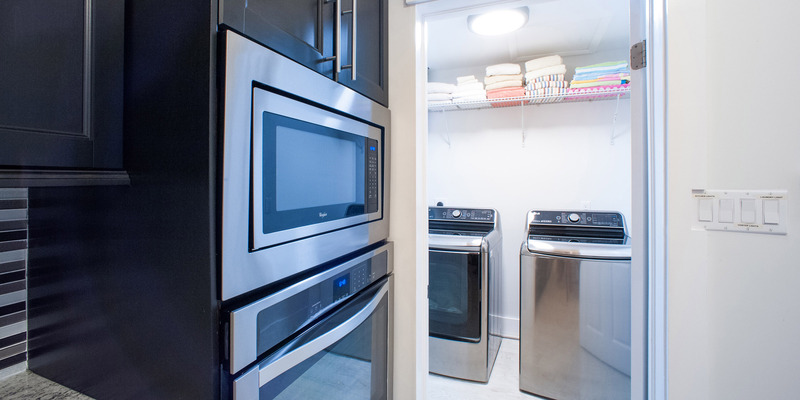 The renovations are spot on, well appointed kitchen, tasteful decor, great washer/dryer. You won't need anything. The bedrooms are spaced out nicely, comfortable mattresses, lovely bathrooms and plush towels. And then you go out back! The ocean view is to die for - amazing snorkeling in your backyard (bring water shoes). Lots of beach towels and plenty of chairs. The pool is perfect - larger than it looks in pictures. The manager and owner check in to make sure everything is ok and see if you need anything. If you are considering renting a private home, I highly recommend this house! We went to 7MB for a day and could not wait to get back to the house to escape the crowds. We are already trying to figure out when we can return!!! Great spacious house. Exceptionally clean and roomy. The snorkeling from the beach in either direction is just amazing. We have stayed here two years in a row now. Just love it here!!! You need to be willing to wake up before 7AM for the amazing sunrise, leave the comforts of Calypso Blue and kayak a short distance from shore... but its totally worth it! Wish I could post the picture we took!!!! Our week at Calypso Blue was fantastic! What an amazing house and location! Quiet, private and every amenity possible! Thank you for the attention to detail! Our vacation here was perfect!! A Grand Time on Grand Cayman! For our family's first visit to Grand Cayman we could not have found a better home than Calypso Blue! 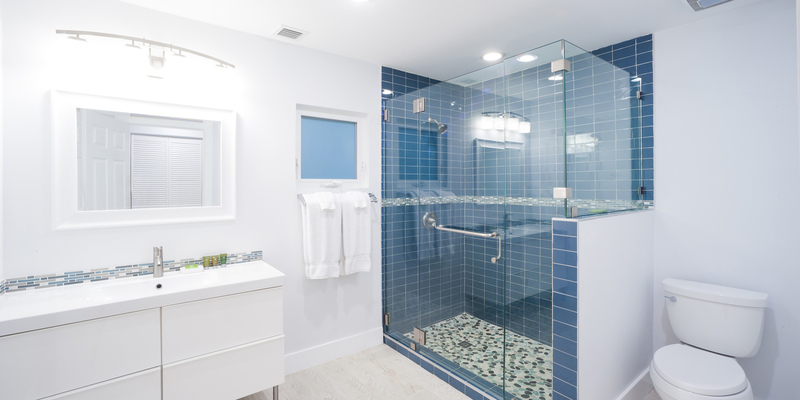 We have stayed in many Homeaway Properties in many locations but have never found one so clean and fully ready for use as Calypso Blue! The owner gave us an email welcome prior to our arrival and provided all the contact information we would need if a problem did arise. The property is on the quieter side of the island however well within reach of what action we wanted to enjoy. This was a wonderful find for our family of twelve! Look no more... This place was Amazing. Great attention to detail. Decor was great, Location minutes from Rum Point. Several good eating places near by with your local small grocery 3 doors down. I will return to this home away from home again and again!!! with family and grandkids. We have not visited the Cayman Islands for three years due to health and other personal issues, so we were greatly anticipating this vacation. Our grown children--one from San Diego and one from Austin, TX--joined us. Since our first vacation to Grand Cayman in 2000 we have carefully selected our accommodations. We voted and, hands down, Calypso Blue was our favorite villa. It was so bright and cheerful, and had every amenity we could have dreamed of. We met some of our neighbors, some of whom were locals of the island. They helped us plan some of our activities, and were gracious enough to "loan" us their gazebo to view some of the spectacular sunsets. We would highly recommend this property to groups of four or more who enjoy the tranquility of the North Side and who love to hear the waves breaking on the beach. We will be back, and won't hesitate booking Calypso Blue again. Wonderful Vacation Start to Finish! We had a fabulous week. This is one of our finest vacation choices! The house was perfect for our whole family. We swam and snorkeled and loved watching the small crabs and green lizards (they like strawberries!). We cooked all of our meals and the kitchen is well equiped for this. We also chartered a boat for half a day from Aquarius - Mario was great. He took us to all the great tourist spots but timed the trip when there would be few or no other people around. Our last day the guys surprised us with Time Out massage at the home - all of the girls got massages to the sound of the ocean! We loved it here and can not wait to come back! The home was everything we hoped for and more. Our group of 10 with two children had plenty of room. The reef out back is amazing and provided hours of adventure. Highly recommend this property. We will be back soon. Love at first sight! ★ ★ ★ ★ ★ We all fell in love with Calypso Blue at first sight. This home is gorgeous inside and out! The newly remodeled interior was beautifully detailed. 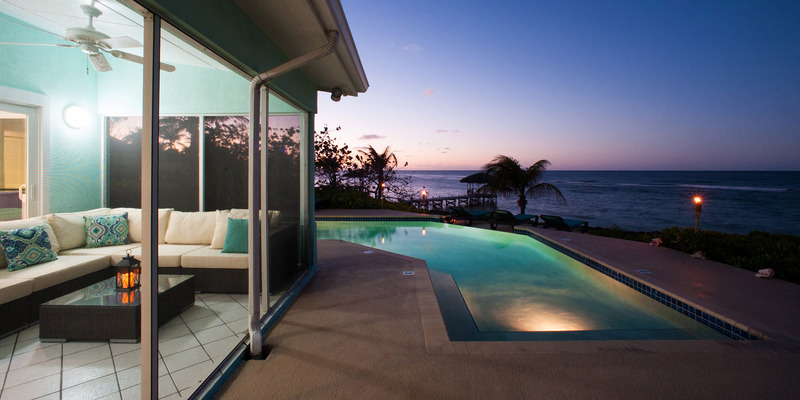 The porch and pool area offers stunning views of the Caribbean blue ocean. The snorkeling was amazing, just steps from the back door. We didn't want our time there to end! We hope to return someday soon! Thank you for sharing your beautiful home! We all absolutely loved our stay at Calypso Blue! It was love at first sight when we walked in the door! The interiors are stunning and the views are amazing. The kids - 4 and 7 - loved playing in the pool all day long, and the adults loved relaxing on the porch, by the pool and walking along waters edge with our coffee in the mornings and "adult beverages" in the evenings! A night swim is a must - the stars are amazing here without city lights! Snorkeling off Calypso Blue's back was amazing and a sunrise trip kayaking was breathtaking. We hope to return again soon! And we highly recommend this amazing home to anyone! Most amazing vacation ever!!!! This house is PERFECT. (We had 2 families with 4 kids total, ages 10-13.) I don't even know where to start. The location is great. It's close enough to restaurants and shopping, but no touristy crowds. Easy to get around. Minutes to Rum Point. The house is absolutely beautiful. It is immaculate. The renovations are spot on, well appointed kitchen, tasteful decor, great washer/dryer. You won't need anything. The bedrooms are spaced out nicely, comfortable mattresses, lovely bathrooms, plush towels. And then you go out back... The ocean view is to die for-amazing snorkeling in your backyard (bring your water shoes). The pool is perfect (it's larger than it looks in photos). Lots of beach towels and plenty of chairs. The manager and owner are amazing. They check in to make sure everything is ok and to see if you need anything. If you are considering renting a house, (instead of staying on 7 mile) I highly recommend this house. (We went to 7 mile for a day and couldn't wait to come back to the house to escape the cruise ship crowds) We are already trying to figure out when we can go back! My wife, my daughters (ages 10 and 13), along with my parents (in their 70's) had the good fortune to stay at Calypso Blue in March 2016 and all of us were extremely pleased with the choice for many reasons. There is its location on the North Side of Grand Cayman. 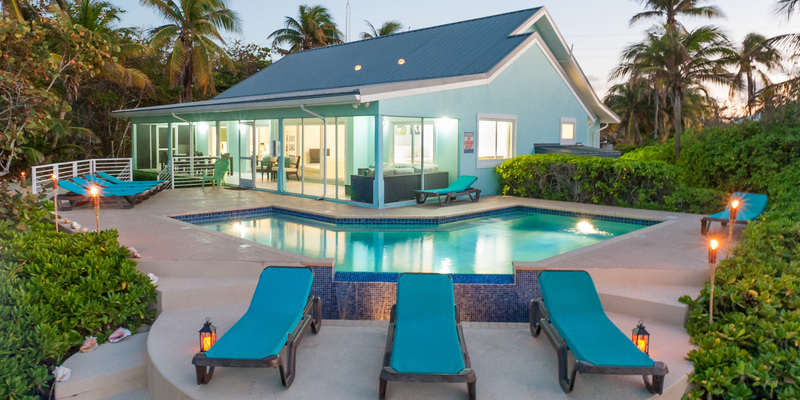 Situated on a reef perfect for snorkelers of all skill levels, it is only about 10 minutes from the sandy beaches (and beach drinks) of Rum Point and about 15 minutes from the diving resorts of the East End. There is a small market within walking distance and several excellent restaurants -- Tukka, Bombay Chopsticks, and Rum Point Restaurant -- within a 20 minute drive. There are local attractions nearby , such as the Crystal Caves and the Queen Elizabeth II Botanical Gardens. The home's setting is beautiful, and although there are nearby homes, it feels secluded and private. The house itself has recently been remodeled and three of the four downstairs bedrooms face the sea and open onto a screened porch and the pool deck. All four bedrooms downstairs bedrooms were master-sized and well furnished, with comfortable beds and remodeled bathrooms. There are loft bedrooms on the second floor, which we did not use. 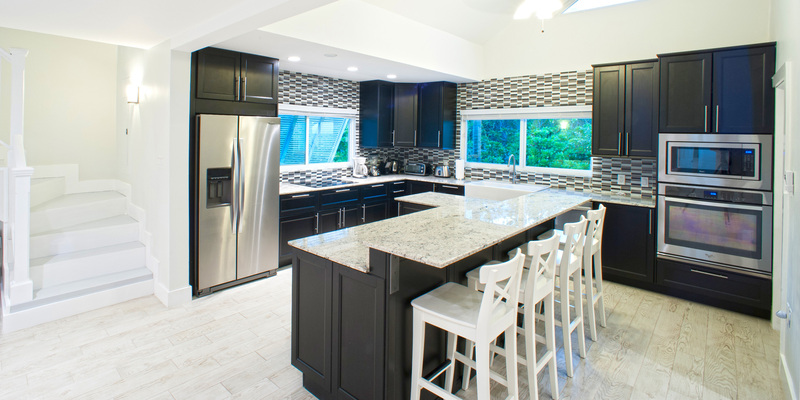 The kitchen had all new top-shelf appliances and a center island that was perfect for getting the family together for breakfast or lunch, and a formal dining room for dinner. The laundry room was equipped with brand new washer and dryer, Two large living rooms with large screen TV's made for comfortable evenings watching March Madness, with the patio doors open and the warm breeze blowing in. The pool was well-maintained and overlooked the ocean, and the views from the home, deck and pool were stunning. 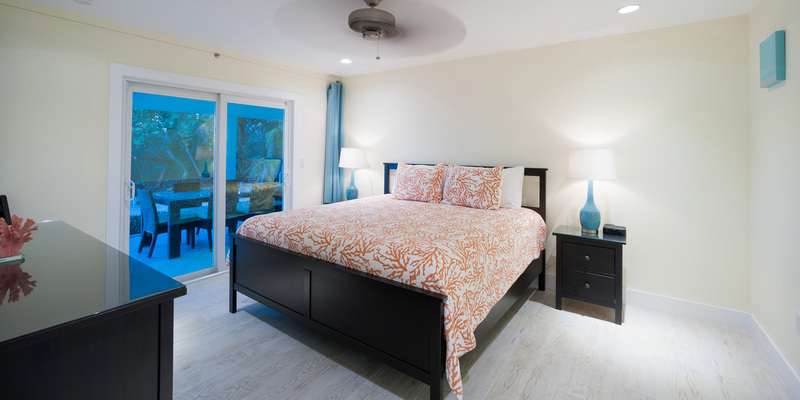 All of my prior stays in Grand Cayman were at resorts on Seven Mile Beach, and I found Calypso Blue to be a fantastic and economically viable alternative for a large party staying during the busy Spring Break season, and I will certainly book it on return trips. We have stayed here both last year and this year for vacation. The house has been completely redone and updated. It was amazingly clean. I don't honestly know how those cleaners get the place so clean! I want to know their tricks. The house is exceptionally spacious and accommodated our party, from a baby to senior citizens, so well. The screened in porch, the sliding doors that spread wide open, the pool (I like that the pool is on the larger side compared to other houses. ), the kayaks, plenty of bathrooms (even a tub if needed for the baby), the open kitchen, two TVs, and on and on. The location also can't be beat. Snorkel in either direction for as far as you want to go, and you'll see great coral and abundant sea life with a depth of water that is perfect for kids or people who don't like to snorkel in water over their heads. Flounder, stingrays, lobster, angel fish, butterfly fish, and seemingly resident huge parrot fish and SO much more! There is a grocery store within a short walk with most all that we needed. Rum Point is a short drive away for a perfect beach and if you want to see some people. And then when you\'ve had your people-fix, head back to your perfect beach get-away. 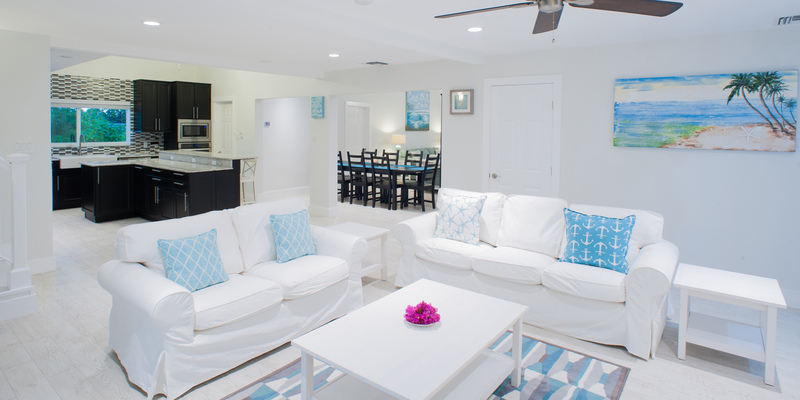 Choosing to stay at Calypso Blue was the best decision we made while planning our trip to Grand Cayman! I travelled with 24 family members and 8 of us stayed at the beautifully renovated Calypso Blue. My 78 yr old parents enjoyed their luxurious bedroom with a walk-in shower, the fully equipped kitchen and the cool and relaxing screened in porch. My children, ages 17-24 loved the infinity pool, snorkeling just off the shoreline, kayaking and free wifi. my husband & I loved everything, especially the close proximity to a small grocery store, Rum Point Restaurants/Beaches and scuba access. Calypso Blue was the perfect house and location for all of us and we will highly recommend it to all of our friends! We picked Calypso Blue for our Grand Cayman vacation and could not have been happier. We are headed home with special family memories of being together. The snorkeling was great all around rum point and right off the beach at the villa. We would recommend chartering a boat to see the Coral Gardens, Stingray City, etc from Blair from Blue Haven! He took us out for an enjoyable afternoon. Our kids loved the pool and the home itself was wonderful and had everything inside that we needed. This was our first trip to the Caymans - what a wonderful way to start by coming into this home to see such a beautiful ocean view! So many creatures to see during snorkeling. Great photography at sunset off the back porch. We explored the island and found some really neat local gift shops - Cathy Church Underwater Photography in Georgetown, Pine Art nearby for locally made unique gifts, etc... The home was great for our kids. They just loved the pool and snorkeling. We also drove a short distance to Rum Point on a couple days - highly recommend that. All-in-all a very nice first of many to come vacations on Grand Cayman and hopefully at Calypso Blue. What an amazing home. We loved the screened porch - spent many afternoons and evenings there. The pool was refreshing and the view fantastic. Snorkeling off the beach we saw stingrays and all kinds of fish. Hard for us to leave. We WILL return and highly recommend Calypso Blue to families. Wow. Such a great view! Loved the pool and porch! Sitting out n the porch in the morning and evening - priceless! Despite some rain, we had an awesome time snorkeling and kayaking, swimming and walking on the beach. Rum Point was lots of fun. Saturday night was a wonderful experience for the Bioluminescent Tour by kayaks. It was a cool and perfect full moon night. Calypso Blue fit our needs perfectly. The furniture was great. We did not have a need to contact the manager, but she did welcome us and offered any help we needed. 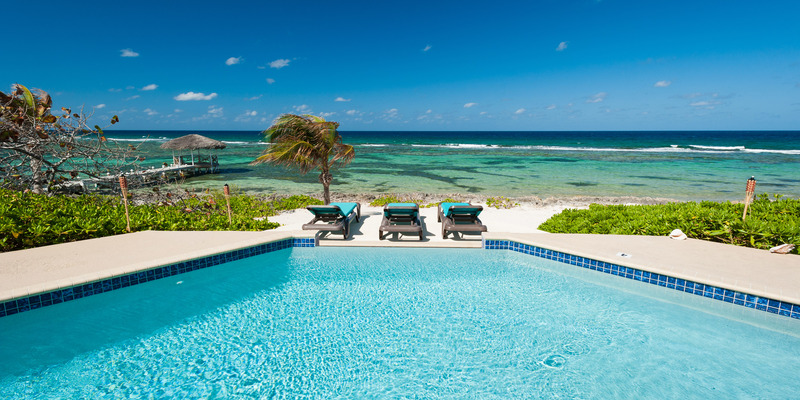 The booking through Grand Cayman Villas was exceptionally professional and complete. We would recommend GCV and Calypso Blue to all families looking at this lovely home. We ate at Tukka and liked it so much we went back for another night. Great food and dining on their oceanfront porch. The kids walked down to the water while the staff fed tarpons and a shark!!! We will be back! Charming home in a beautiful setting! Pool and the view are awesome! Our whole gang thoroughly enjoyed our stay at Calypso Blue. Cant wait for a return trip! This was our third time and our BEST trip! Calypso Blue was perfect1 Stingray City is always a must as is Rum Point and Spotts Beach - we swim with wild turtles! Ate at Tukka for final night and watched a shark circle throughout our meal. The home itself is beautiful, well stocked and we thoroughly enjoyed every amenity. Waking up here vs back home will never compare! GREAT UPDATES TO THE HOME!!!!! Wow. 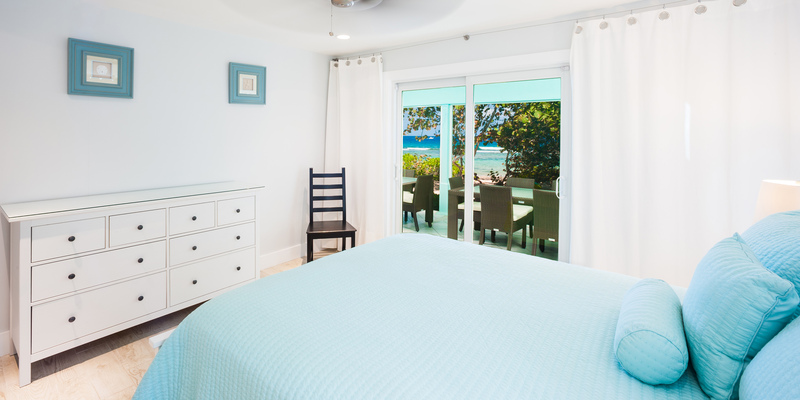 We stayed at Calypso Blue before the major renovations, but the home is new in every aspect. The improvements really made the home more enjoyable and with the addition or the two bedrooms upstairs we were able to bring additional family members with us. The pool, porch, beach, sun, ocean , snorkeling, swimming and walks on the beach are still the same and fantastic! 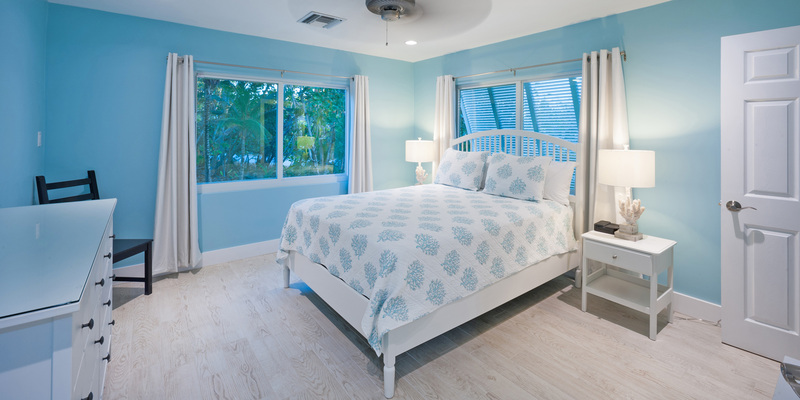 We highly recommend Calypso Blue to those guests looking for a nice family vacation! We stayed with a large group at Calypso Blue for a week. Only wish it was longer!!! Our stay was outstanding! We scuba dive, snorkeled, and went sight seeing. Never a dull moment! The reef right off the property was incredible. And the accommodations were great! The attention to detail in the home shows the love and passion of the owner to the property. We had a large group come to Grand Cayman to celebrate our wedding at Grand Old House. We enjoyed snorkeling right off the beach where we saw tons of fish (including a lion fish and eels)! We also enjoyed the Atlantis submarine, Stingray City tour through Captain Marvins, and the Crystal Caves, The house was everything advertised in the pictures and more.We cant wait to return to the fabulous sunsets and snorkel some more. This is our second time at Calypso Blue and we always have great experiences! You absolutely need to snorkel in your own backyard! Followed by a dip in your own pool! Maybe kayaking in the morning and soaking up sun in the afternoon, Calypso Blue provides everything that you would expect from a 5 star resort! Over the Edge Cafe is a must for lunch or dinner and of course Tukka is an excellent dinner place with different dinner themes. We will be back again I'm sure! Calypso Blue is an amazing home away from home... it is absolutely beautiful inside and out and comfortable for friends and family of all ages. Our family had an amazing time and we are leaving with memories for a lifetime and fun stories to tell! We plan to come back yearly. If you go out for a run watch out for the dogs! And if you hear a knock on the door it may be a friendly crab we called Norbert. When you take a float to the ocean keep your rear out of the sea urchin beds! Dont get sideways with a wave while kayaking. Never be in a hurry - island time is real and dinner at Over the Edge can be really slow. Go there early or late. And finally always wear a blanket of sunscreen! On a serious note Calypso Blue has it all!!! We never wanted to leave the refreshing pool while our stare got lost in the ocean waves. The kids loved hunting for hermit crabs and building sand castles. Snorkeling off the beach couldn't be beat. There are amazing sea animals right behind this house. But if you do go out for some extracurriculars, DON'T miss a trip to Stingray City, the Big Reef snorkeling or Starfish Point. Also Rum Point has great entertainment and food. And Kaibo Beach has amazing food as well. Tukka is a fantastic restaurant as well, and although slow when we were there, the food was good. Cant wait to stay at Calypso Blue next time!!! Calypso Blue is an amazing home! The reef and snorkeling right off the beach is incredible. Inside accommodations and decor are great! The kitchen is modern and well stocked. So much attention to detail! And the sunsets - awesome! We went scuba diving, snorkeling and sight seeing all over the island. Our stay at Calypso Blue was outstanding. We highly recommend this pretty villa! We Cant Thank you enough for all the amazing features of this big beautiful house. We spent time in the pool, strolled the beach and took full advantage of the puzzle collection on our down time. Calypso Blue was perfect for our big group of researchers being able to unwind peacefully after a long day of diving and data collection. Sad to leave this island for chilly Wisconsin, but it truly was an amazing trip. Wonderful Vacation at Calypso Blue! Calypso Blue is perfect, great restaurants, pool, beautiful setting, very private. Loved the sunsets and the sounds of the sea at night to sleep by, the "hoot" owl, and green frogs!The owner and property manager made sure everything was perfect. Tukka restaurant was fantastic and Rum Point was a favorite spot. We loved our stay at this beautiful house.We d\'id the dolphin lovers swim at dolphin discovery which our 4 yr old loved. That day also included a trip to the turtle farm, but wouldn\'t have been worth it if that was all we did that day. We loved snorkeling right off the beach and sent alot of time in the pool with the kids. We also spent several mornings at Rum Point - arrived at 9:30am and got great beach chair location. A short drive from Rum Point is Starfish Point and saw several big starfish. Birthday Celebration at Calypso Blue!! We had a spectacular time - the home was perfect! We swam, snorkeled right off the beach and visited Starfish Point, and Stingray City to swim with the stingrays. We also visited the Turtle Farm and held the turtles. We snorkeled at Smith cove as well - highly recommended. This was the first snorkeling for several of our children and it proved to be a great experience. We also visited 7 mile beach for a day. The home was very well taken care of - you can tell alot of heart and soul went into decoration and the kitchen was stocked with everything we needed. Bedrooms were comfy and bathrooms spacious. The booking and reservation process was flawless. 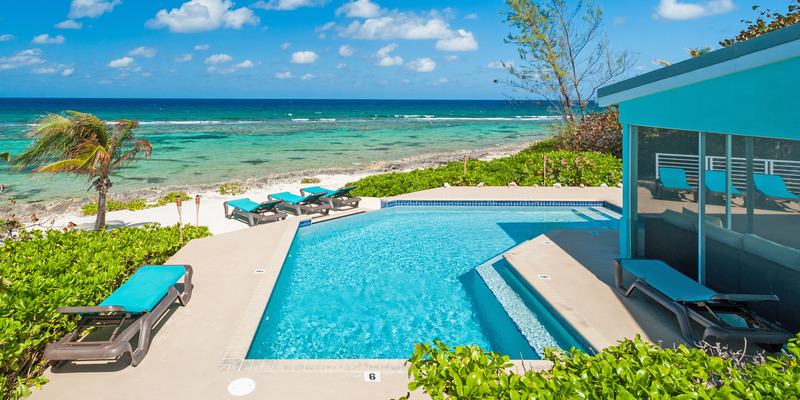 We highly recommend Calypso Blue and Grand Cayman Villas to anyone looking to travel to Grand Cayman!!! I booked Calypso Blue for my family to gather to celebrate my wife\'s birthday. We were a party of 8 adults and 5 children - 2 six year olds, 1 four year old and 2 under a year old. 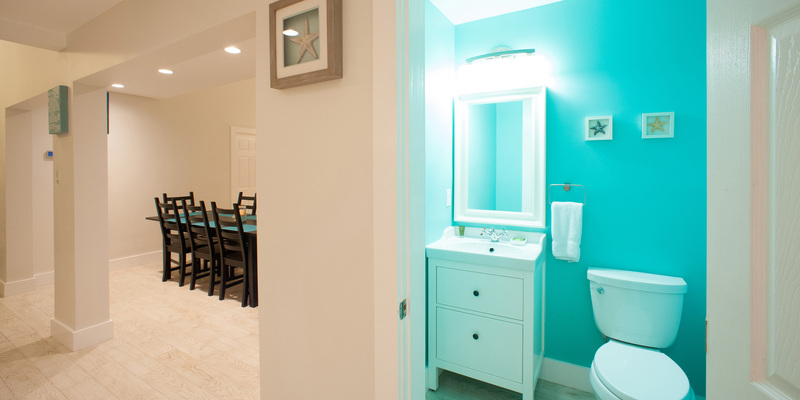 If I had to design a beach house for our group, I would have been Calypso Blue. Upon arrival we were struck by cleanliness and comfort of the property. 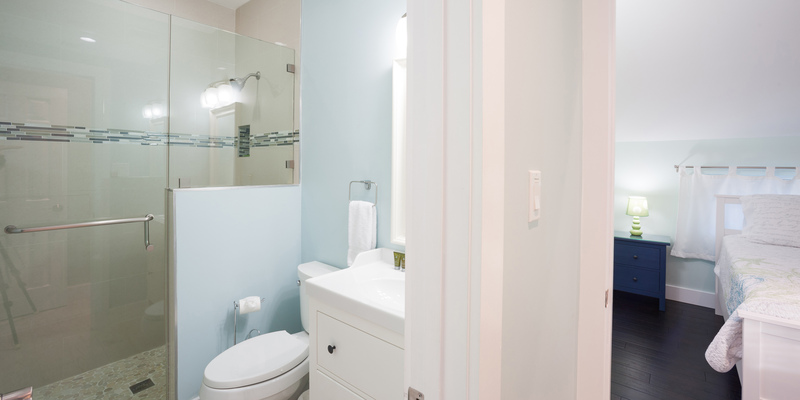 The home fit us perfectly and with the newly renovated interior it was terrific. Nothing has been spared to make you right at home. The kitchen has all the needed utensils available, great new appliances throughout the kitchen and laundry room. The bedrooms were spacious and very comfortable. The upstairs bedrooms were perfect for the kids. The outside pool and beach area is great. You need beach footwear when entering the surf, but you will enjoy some great snorkeling right off your own very private beach. There was a caretaker that stopped by to make sure the pool was clean and working properly, and the property manager was readily available when we reached out with a few questions. There were plenty of great places to dine and have a few cocktails in the area. Our group rented a couple of vans for the week, so there were quite a few day trips all around the island. I found this vacation to be one that we all will cherish for years to come, and Calypso Blue was more than we could have asked for. I would highly recommend this property to anyone who is looking for a clean, fresh, well maintained and managed property. Our week at Calypso Blue could not have been more perfect! The new renovations are clean and tasteful allowing each guest to relax and enjoy the best of everything. 24 of my family members travelled to Grand Cayman and 8 of us (ages 17-78) stayed in Calypso Blue. My parents enjoyed the screened in porch, fully equipped kitchen and luxurious bedroom with a walk-in shower. My four children preferred the pool, snorkeling, kayaks and free wifi. Kevin & I loved it all and were grateful for the close proximity to a small grocery store, Rum Point restaurants like Kaibo Yacht Club, beaches and scuba locations. I can also recommend chartering a private boat from Captain Marvin\'s Watersports. All 24 of us had the opportunity to snorkel and swim with the stingrays. Everything was well thought out and convenient. 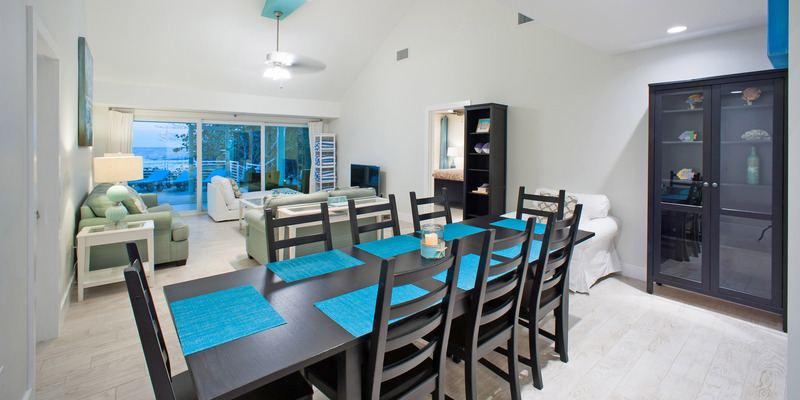 We would definitely return to Calypso Blue for a sunny, luxurious, fun-filled vacation! spent a week at Calypso Blue with 4 other family members including a one year old. The house was amazing. We walked in to a clean, cool and inviting oceanfront villa. The house was spotless upon arrival which immediately made us feel welcome. Calypso Blue was in an excellent location, away from the hustle and bustle of 7 mile beach which was exactly what we were looking for. I agree with the last reviewer - the house was nice and clean and had a very functional floor plan. 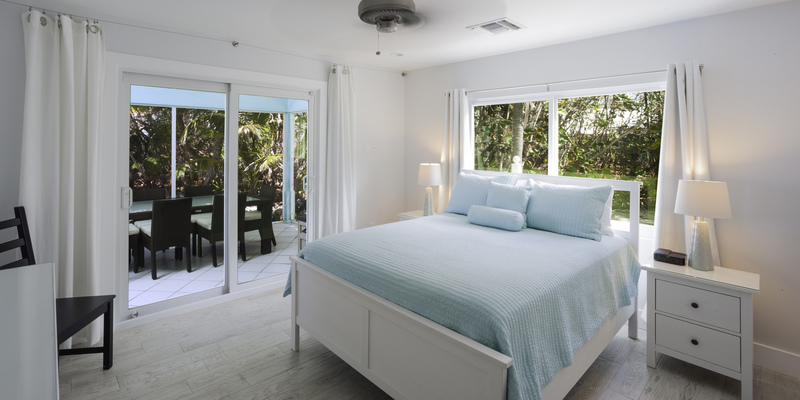 With two new bedrooms upstairs and recent renovations completed I am sure it is even more idyllic way to spend your vacation. There is a large patio out back (screened-in) and we took full advantage and spent quite a bit of time relaxing in the shade with the calm tradewinds keeping us cool. We also loved the pool and pool deck with plenty of room to spread out the lounge chairs and swim in the pool with family. There is also a large sandy beach with easy access to snorkel at the shoreline (wear water shoes). What impressed me most was the great floor plan including a nice wing so if you go with two or more families there is room to spread out and plenty of privacy. The kitchen was huge and well equipped. We also found the cleaning crew to be very friendly even checking in to make sure everything was satisfactory after our arrival late in the day. 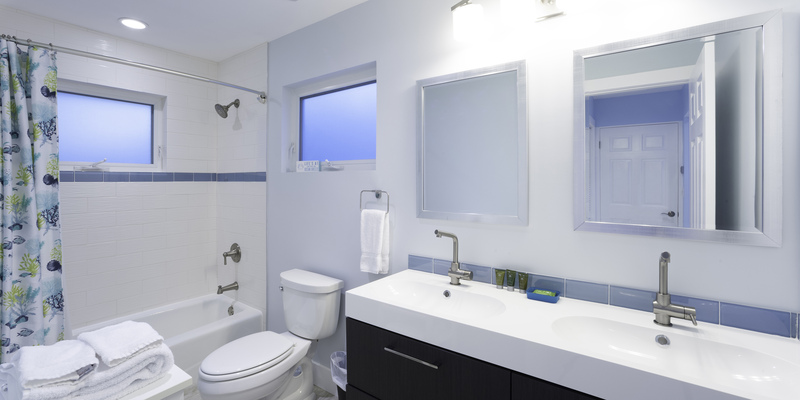 Overall we highly recommend Calypso Blue and can\'t wait to go back to enjoy the all new interior!! This was a family vacation we will never forget.